From 1907 to 1909 the number of movie theatres increased rapidly, a mixture of old vaudeville halls revamped into cinemas and the construction of new edifices more or less resembling Western style theatres. By 1909 more than 40 film theatres were operating in Tokyo, of which 30 had opened that year (Yoshida: 72-73, Ueda: 53). It is generally accepted that the second permanent film theatre built in the country was the Shinseikan, which opened its doors on April 1 in the neighborhood of Kanda, Tokyo. However, there is also evidence of a variety hall in Asakusa, Tokyo, that had held performances of female divers having been reconverted into a film theatre which reopened as the Bionkan in January (Ueda : 53). On April 16, the film production, exhibition and distribution company Yoshizawa Shoten inaugurated a new cinema in this same area, the Asakusa Sanyukan. Meanwhile, in Osaka the production company Yokota Shokai launched its own Denkikan movie theatre in the Sennichimae district to become the first one in the Keihanshin region, comprising the cities of Osaka, Kyoto and Kobe. Sennichimae would see another cinema, the Bunmeikan, opening on December 20. The most dramatic example of this shift in entertainment preferences took place in Asakusa's Rokku theatre district soon to become the country's movie-goer's Mecca. The misemono (sideshow) halls that had once lined the streets of the Rokku district were quickly replaced by theatres showing films from 1907 until the beginning of the Taisho period (1912-1926) (1). As pointed out by Ueda Manabu many of these cinemas had in fact been operating as yose (variety hall) hosting all kind of misemono performances before they were remodeled into film theatres (see my article on the Asakusa Denkikan). Thus, the Asakusa Sanyukan had served as a bazaar prior to its conversion into a cinema while the Sennichimae Denkikan had been functioning as a yose, the Masae-za, and so had the Bunmeikan, known earlier as the Daini Izutsu (2). Even after their renovation into cinemas, most still continue to feature in their programs a variety of misemono shows, kineorama (an admixed form of diorama, film projections and electric light effects), and, most importantly, rensageki performances. The latter, in fact, fought with only-film performances for supremacy in the theatres until the mid 1910s. The following year more cinemas opened in Tokyo (in Asakusa the Fukujukan, April, the Taishokan and the Fujikan, July. In Kagurazaka the Bunmeikan, May. In Ushigome, now Shinjuku, the Bunmeikan, May. For a period of time this cinema was also called the first Bunmeikan or Daiichi Bunmeikan (Yoshida: 64). In Honjo the Taihekan, June. In Asabu, now Minato, the second Bunmeikan or Daini Bunmeikan, September) and Osaka (the Naniwa-za in Dotonbori, January, in Sennichimae the Daini Sekaikan, September, and the Nihonkan, November) as well as other major cities such as Nagoya (the Bunmeikan in Osu Kannon, January, and the Chuo Denkikan in Hirokoji, April)and Kyoto (the Shinkyogoku Denkikan, February, run by the Yokota Shokai). Meanwhile, according to the Yokohama Archives of History, in December 1908 the first film theatre in Yokohama opens in the Nigiwai district, the M Pathe Denkikan, known as the Shikishimakan from 1909 (3). However, other sources argued instead that the first cinema was the Kinemakan in the Fukutomi district, owned by Uchiyama Umekichi, and which opened in May 1908 (4). It was remodelled and converted into a two-storied Western style theatre renamed as the Denkikan, also known as the Kanko Kinen Denkikan, in September the following the year. This might explain the change of name of the cinema run by the M Pathe Company. At the end of the Meiji period there two famous troupes of acrobats balancing on rolling balls in Asakusa; the Aoki's Tamanori troupe and the Egawa's Tamanori troupe. While the Aoki's troupe disbanded and the Daiichi Kyoseikan hall, which had opened in the 1880s, where they had held their acrobatic shows turned into the Asakusa Taishokan cinema in July 1908, the Egawa's troupe continued to perform at their misemono koya (hall) Seiyukan (known as the Taiseikan from 1901) until 1923 (Yoshimi : 211-12). Before its conversion into the Taishokan, the Daiichi Kyoseikan's acrobatics on balls programme held in the afternoon was complemented by an evening exhibition of moving pictures. Also, according to Irie Yoshiro's study of extant stills from some of the earliest films shot in Japan, there is evidence that one of these films, of which only 8 frames survives, featured the Egawa's troupe (Irie : 73). The Fujikan that opened on 13 July 1908 in Asakusa, Tokyo, had been called the Chin Sekaikan, while the Daiichi Kyoseikan, also in Asakusa, became the Taishokan starting business on the same day that the Fujikan. 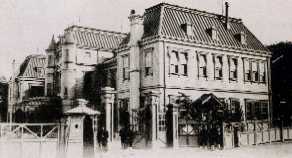 Ogasawara Mikio proposes the date of its opening as 1 January 1908, reopening as the Shikishimakan on 11 June 1908 (28). Yokohama Rekishi to Bunka - Kaiko 150 Shunen Kinen is among one of the publications that claim that the M Pathe Denkikan was the first cinema in Yokohama (264), while others such as Yokohama-shi o Aruku (172) and Yokohama Kindaishi Sogo Nenpyo (321) argued that it was the Kinemakan. Before its conversion into the Kanko Kinen Denkikan film theatre, the Kinemakan is described as a kasetsu koya or temporary playhouse (Yokohama-shi Chuo Toshokan Kinenshi Henshu Iinkai hen: 41), which could account for this discrepancy. Irie, Yoshiro Saiko no Nihon Eiga ni Tsuite - Konishi Honten Seisaku no Katsudoshashin (The Earliest Japanese Movie �\ Motion Pictures Produced by Konishi Honten), MOMAT Research, 2009, Vol 13, pp.65-91. Iwao, Akune, Ganso, tamanori kyokugei oichiza : Asakusa no misemono, Tokyo: Arina Shobo, 1994. Kaneko, Atsuko, Ongaku Bunka to Engeki in Shinshu Nagoya-shi Shi; Meiji, Volume 5, Edited by Shiozawa Kimio and Kondo Tetsuo, 2000, pp 838-848. Matsunobu, Tasuke, Ishii, Mitsutaro, Tokairin, Shizuo (editors), Yokohama Kindaishi Sogo Nenpyo, Yurindo, 1989. Murou, Saiseki, Chindon Sekai, in Modan Toshi Bunkaku: Toshi no Shuen edited by Unno Hiroshi, Kawamoto Saburo) and Suzuki Sadami, March 1993, pp 289-297. Nornes, Abe Mark and Gerow, Aaron (editors), Eigagaku no Susume: Makino Mamoru ni Sasageru / In Praise of Film Studies: Essays in Honor of Mamoru Makino, Yokohama: Kinema Club, 2001. Oda, Sadao, Yokohama-shi o Aruku, Nihon Hoso Shuppan Kyokai, 1977. Ogasawara, Mikio , Shinbun Shosetsu no Gekika ni Tsuite, in Shotokushu Yokohama no Shibai to Gekijo Yokohama Kaiko Shiryokan Kiyo, Dai 10 Go, 1992, pp 26-33. Takamura, Naosuke and Yokohama-shi Furusato Rekishi Zaidan (editors), Yokohama Rekishi to Bunka: Kaiko 150 Shunen Kinen, Yurindo, 2009. Ueda Manabu, Eiga Josetsukan no Shutsugen: 1900-nendai no Denkikan to Sono Kankyaku Kara / The Emergence and Transformation of the Moving Picture Theaters: An Analysis of the Denkikan theater and the Cinema Audience in the 1900s, Art Research, 9, 2009, 49-59. Yokohama-shi Chuo Toshokan Kinenshi Henshu Iinkai hen, Yokohama no hon to bunka : Yokohama-shi Chuo Toshokan kinenshi, Yokohama-shi : Yokohama-shi Chuo Toshokan, 1994. Yokohama-shi Kowankyoku Kikakuka and Yokohamako Shi Kanko Inkai, Yokohama-ko Shi Dai 2 Kan, Yokohama Koshinko Kyokai, 1989. Yohohama Kaiko Shiryokan / Yokohama Archives of History, Shiryo Yomoyama Hanashi 2: Yokohama ni Eigankan Nakkata Koro. Yohohama Kaiko Shiryokan / Yokohama Archives of History, Shiryo Yomoyama Hanashi 2: Gekieiga no Kokai. Yoshimi, Shunya, Toshi no Doramaturugi: Tokyo sakariba no Shakaishi, Kawade Shobo Shinsha, 2008. In 1907 Japanese film production was dominated by just two companies, the Yoshizawa Shoten and the Yokota Shokai. Their combined output, consisting almost exclusively of film actualities, was nevertheless very scarce. Employed at Yoshizawa since he was eighteen, Konishi Ryo (1) was the most prolific of the cinematographers working at the time. He has been acknowledged by film historian Tanaka Junichiro as the maker of short documentaries such as Ryogoku Kokugikan no Ozumo Jikkyo (Scene of Grand Sumo at the Ryogoku Kokugikan), Aomori-ken Same Kogai no Bogei (Whaling at Same Outer Harbor in Aomori Prefecture), Ainu no Kumagari (Ainu Bear Hunting) and Ashiodozan no Sutoraki (Strike at Ashidozan Copper Mine) (Tanaka 1980: 133). A year earlier he had also filmed Konoe Daichi (Imperial Guard First Regiment), Nireentai Kasogyoretsu (Second Regiment Full Dress Parade), Korakuen Ozumo (Grand Sumo at Korakuen), Hibiya Koen Rikugundaijin Kangekai (Minister of War's Welcome Reception at Hibiya Park), Shinbashi Teishajo no Taika (Large Fire at Shinbashi Railway Station), Konnoto Denka Yokohama Gochaku (His Highness Prince Arthur of Connaught Arrival in Yokohama), Konnoto Denka Goran no Geisha Teodori (His Highness Prince Arthur of Connaught Viewing a Teodori Geisha Dance) and Daimiyo Gyoretsu (Daimyo's Procession) (2) all exhibited at the Denkikan on 1 March 1906 (Tanaka 1979: 21). From the second half of 1907 the subject of many documentaries shifted to the Korean problem as both film companies, Yoshizawa and Yokota, were asked by Ito Hirobumi, former prime minister and then resident general in Korea, to produce a series of scenery films and travelogues promoting a positive and tranquil image of Korea to try to curb anxiety in Japan over news of rioting and disorder from the neighboring country (3). In September 1905 Russia had signed a treaty after its defeat against Japan in which it recognized the latter's political, military and economical rights in Korea and promised not to interfere with any actions Japan might take in its new protectorate. This treaty, known as the Treaty of Portsmouth, was immediately followed by another signed between Japan and Korea. Japan had already taken control of the Korean banking system along with postal and telegraphic communications and railway services (Keene: 637). This new agreement, signed on November 18, effectively gave Japan complete control over Korea's foreign affairs finalizing its status as a protectorate of Japan. Ito Hirobumi, who had informed the Korean Emperor of the conditions of the Portsmouth Treaty and had led the negotiations with the Korean government, became the first resident general in Korea on December 21, 1905. Two years later, further control was imposed by Japan over Korean affairs in another agreement signed in at the end of July by which the Korean government ceded all its effective remaining power over domestic affairs which culminated with the disbandment of the Korean Army on July 31. Although Ito was able to find some support among pro-Japanese Korean officials, public anger over the conditions imposed by Japan was generalized leading to mass demonstrations and the emergence of several resistance movements which activities continued, reaching their peak in 1908, for the following 3 years until Japan formally annexed Korea into its Empire on 22 August 1910 (Seth: 279). Attacks by anti-Japanese forces numbered 323 in 1907, 1,451 in 1908, 898 in 1909, 147 in 1910 and 33 in 1911 (Boku 2006: 138). The Tokanfu (Residency-General Department, Japanese governing body in Korea) headed by Ito set out to assuage some of the Japanese public anxiety about a looming Korean insurgency by organizing screenings around the country of daily scenes of a peaceful Korea. Yoshizawa Shoten's manager Kawaura Keinichi was appointed for the project and traveled to Korea with one of his cinematographers, Konishi Ryo, to shoot the scenes (4). Around the same time, the Kyoto-based Yokota Shokai film company was also commissioned with a similar assignment. Kankoku Fuzoku (Korean Customs and Manners), Tokanfu Enyukai (Residency-General Garden Party) were two of the films resulting from this early domestic propaganda venture released at Osaka's Bentenza theater on 17 May, 1907. These films are thought to be the first ones shot in Korea to be exhibited in Japan (Boku 2007 : 41). The screening also included Itaria no Gyofu no Seikatsu (Living of Italian Fishermen), Igai no Tosen (Unexpected Winner) and a re-release of Momijigari (1903) (Boku 2007: 41). A year later, Yokota Shokai was again in charge of a series of films about Korea released under the title Kankoku Isshu (One Week in Korea) at the Kinkikan theatre in Kanda, Tokyo, on 1 June, 1908. The program featured scenes of activities run by the Tokanfu as well as scenic films, travelogues and other scenes reflecting the customs and manners of the Korean people. Their screening coincided with the opening of Yokota's branch office in the Korean capital, then called Keijou, in the neighborhood of Chinkoge where the Japanese community resided. This collaboration with the Tokanfu under the supervision of Ito intended to present Japanese audiences, as it had been the aim of the films shot by Yoshizawa Shoten's cameraman Konishi Ryo a year earlier, a peaceful and tranquil image of the country, arousing their interest in their soon to be new colony and, at the same time, concealing the chaotic political situation of the country (Boku 2006 : 7-8) (5). 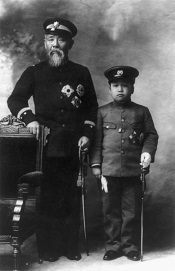 To further strengthen the power grip over Korea and paved the way to its assimilation, Ito decided to take under his tutelage the 10-year Korean Crown prince Yi Un and brought him to Japan with the excuse of providing the boy a proper education and deepening the eternal friendship between both countries. Becoming a de-facto political hostage, Yi Un was being indoctrinated about the superiority of Japan's military power, technological development and refined culture. The consequent Korean public's uproar was responded with a string of film documentaries commissioned by Ito to offer as proof of the safety and happiness of the crown prince while in Japan since his arrival in Japan in December 1907 until the end of 1909, months before Japan's official annexation of Korea. Discrepancies over the makers of these documentaries are found in both English and Japanese sources. Nornes appears to suggest that the production of all these films following the Korean Crown prince's tour around Japan was undertaken by Yoshizawa Shoten (page 12). Sato, however, credits to Yokota Shokai an early documentary from the series, Kankoku Kotaishi Denka, Ito Daishi Kankoku Omiya Nyukyo no Kokei (Scene of His Imperial Highness the Prince of Korea and Ito Hirobumi Entering the Imperial Palace), in Nihon Eiga Shi Volume 4 (1995 : 145) and again (2007 : page 63) but later to Yoshizawa Shoten (Shirizu Nihon no Dokyumentari, volume 5, page 6). The publication Nihon Eiga Shi Taikan Eiga Torai Kara Gendai Made - 86 Nenkan no Kiroku (page 65) also attributes this particular segment to Yokota Shokai released in December, soon after being shot, at Osaka's Tenma-za. Furthermore, Boku explains how the Kyoto-based production, exhibitor and distributor company was asked by Ito Hirobumi to produce a visual record of Yi Un from his arrival in Shimonoseki on 7 December 1907 to his final destination, after a brief stop in Kyoto, at the Detached Shiba Palace in Tokyo on December 15, followed by a visit to the Imperial Palace three days later (Boku 2006 : 13). At this time, rumors about the Prince having been murdered began to circulate in Korea. Ito, anxious to clear any suspicions, hired the Yoshizawa Shoten to produce a documentary film depicting the young prince enjoying his stay in Japan at his new residence in Torizaka Street where he had moved on 9 February 1908 (Boku 2006 : 139). This contradicts Nornes claim that this project had been commissioned a year earlier, but, in fact, from the spring of 1908. Regarding Konishi's first name, Donald Richie (2005: 23), Komatsu Hiroshi (1992: 244) and Keiko McDonald (1994: 39) have all translated it as Ryo whereas Jasper Sharp (2011: 45) prefers to render it as Toru. This is due to their different choice of Chinese character or kanji for the name. The kanji which can read as Ryo is listed in works by Tanaka Junichiro, who personally interviewed Konishi in 1942, Sato Tadao and other Japanese film historians whereas I have only been able to find the kanji character read as Toru in the Japanese Movie Database entry for this early cinematographer. In 1901, Ito Hirobumi, then prime minister and in direct control of the Taiwan Affairs Bureau, had invited political activist Takamatsu Toyojiro to screen films around the island to enlighten the native Taiwanese over the benefits of being part of the Japanese empire and to entertain the Japanese emigrants (Lee 2012: 5). 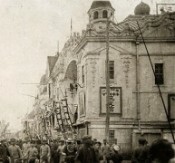 The screenings in which Takamatsu also acted as a benshi presented scenes of the Peking Battle by the Eight-Nation Alliance and the Boer War (Lee : XXV). As pointed out by Boku, nothing is known of this proto-propaganda film production enterprise except for the reminiscences of Konishi himself made to film historian Tanaka Junichiro during a conversation they had on 26 October 1942 (Boku 2007 : 60) (Tanaka 1979: 23). Tanaka Junichiro considered Kankoku Isshun and Kankoku Kan (1979 : 24) as the same work though the contents featured in each film were totally different. Boku explains that Kankoku Kan presented Sunjong emperor of Korea progress tour in Korea accompanied by Ito Hirobumi which took place between January and February 1909. After 3 years of the establishment of the Tokanfu in Korea in 1906 anti-Japanese feelings continue to escalate. To contain this Ito decided to embark on a tour with the emperor of Korea and observe the real conditions of the country. This time the tour was filmed by Yokota Shokai's technician Fukui Shigekazu (Tanaka 1979 : 24). Regarded as one of the most representative early works of this production company, Kanko Kan is not just a simple documentary but a piece of propaganda film endorsing Japanese ruling of Korea and emphasizing the need for Japanese-Korean unity. Boku, Fanmo, Kankoku Kotaishi to Ito Hirofumi Meiji Maki no Nikkan Koshitsu ni Okeru Eiga no Yakuwari in Eiga no Naka no Tenno: Kindan no Shozo edited by Iwamoto, Kenji, Shinwasha, 2007. Boku, Fanmo, Chosen Sotokufu no Sokuminchi Tochi ni Okeru Eiga Seisaku, Ph.D. thesis, Waseda University, 2006. Keene, Donald, Emperor of Japan: Meiji and His World, 1852-1912, Columbia University Press, 2002. Lee, Daw-Ming, Historical Dictionary of Taiwan Cinema, Scarecrow Press, 2012. McDonald, Keiko I., Japanese Classical Theater in Films, Fairleigh Dickinson University Press, 1994. Nornes, Abé Mark, Japanese Documentary Film: The Meiji Era Through Hiroshima, University of Minnesota Press, 2003. Richie, Donald, A Hundred Years of Japanese Cinema: A Concise History, With a Selective Guide to DVDs and Videos, Kondansha, 2005. Sato, Tadao, Nihon Eigashi , Volume 4, Iwanami Shoten, 1995. Sato, Tadao, Nihon Eigashi , Volume 4, Iwanami Shoten, 2007. Sato Tadao, Shirizu Nihon no Dokyumentari (5), Iwanami Shoten, 2010. Sharp, Jasper, Historical Dictionary of Japanese Cinema, Scarecrow press, 2011. Tanaka Junichiro, Nihon Kyoiku Eiga Hattatsushi, Kagyusha, 1979. Tanikawa, Yoshio, Nenpyo Eiga 100-Nenshi, Futosha, 1993. According to film collector Misono Kyohei (Kinema Junpo: 85) the first film adaptation of the popular story of Chushingura was released at the Hongo-za theater in Tokyo on 7th December 1907 with the title of Chushingura Godanme. Chushingura Godanme is in essence a documentary film or, to be more precise, a recording of a stage-like performance of Chushingura's 5th act by kabuki actor Kataoka Gato III to commemorate his stage name succession (shumei) to the professional name Kataoka Nizaemon XI in January . Komatsu Hiroshi has argued that the re-release of Momijigari at Osaka's Benten-za theater on 17 May 1907 sparked a trend in film adaptations of kabuki plays (1992: 244). The little information that we have about this production is mostly based on the interview that cinematographer Konishi Ryo had with film historian Tanaka Junichiro in 1940 (1980: 133-34) (1). The same team, comprised of Konishi and Nizaemon, also filmed the dance Hashi Benkei (Benkei on the Bridge) screened along with Chushingura Godanme. The first, arguably, feature film adaptation of this famous revenge story was a segment produced by Yokota Shokai in 1910 and directed by Makino Shozo. More episodes were produced during the following years all starring Japan's first film superstar Onoe Matsunosuke in three different roles, Oishi Yoshio, Asano Naganori and Shimizu Ichigaku (2). The surviving film fragments of these productions made between 1910 and 1912 are kept at the NFC. The Matsuda Film Productions also holds an edited version of scenes from 1910 to 1917 compiled and edited in the postwar years with benshi narration and samisen accompaniment under the title of Onoe Matsunosuke no Chushingura. It is believed that the 1910 production accounts for most of this edited version (see Matsuda Film Productions website). These two compilations are considered to be the oldest example of Japanese fictional cinema in existence (3). Keiko McDonald (1994: 39-41) provides an extensive description of this work, which is, nevertheless, basically based on its entirety on the conversation that Tanaka Junichiro had with Konishi Ryo (1980: 133-34) and which she fails to cite. Furthermore, she calls the actor Kataoka Nizaemon XI Jinzaemon Kataoka X and dates the production of Chushingura Godanme, first, to 1908 and a few lines below to a year earlier (40). On the other hand, Komatsu also reproduces an excerpt from Konishi's account of the shooting of Chushingura Godanme, this time citing the original source (1992: 245). A common practice in kabuki achieved through the hayagawari technique (literally "quick change" of costume) in which the same actor changes roles during the same performance often carried out in front of the audience's eyes. With regards to Chushingura Donald Keene explains how "the actor Ichikawa Danzo discovered a way of making such quick changes that he could appear in the three major roles of the fifth act, Sadakuro, Yoichibei, and Kampei. (1982: 10). Chushingura Godanme's cinematographer Konishi Ryo recounted how he filmed the actors' hayagawari just as in a kabuki play (Komatsu: 245, translated from Tanaka: 133). In 2015 a Pathe Baby 9.5 mm print of Jitsuroku Chushingura (Ikeda Tomiyasu, 1926) also starring Onoe was discovered among other film prints donated to the Toy Film Museum in Kyoto by a private collector in Kumamoto Prefecture. The discovered print is a Pathe Baby 9.5mm in its complete form (66 minutes) distributed in this format at the time although the original film ran for 196 minutes divided into 20 reels. A fragment of the film that has also survived is another Pathe Baby edition that runs for about 20 minutes and it is kept at the Kyoto National Museum. The discovered complete version includes the Matsunoroka incident at Edo Castle as well as the scene when Oishi, played by Onoe Matsunosuke, leads the raid on the Kira mansion on a snowy night. Although the link to the original article appearing in the English version of the Asahi Shimbun is now broken, the full text of the article can still be reached here. Irie, Yoshiro, The First Movie Star in Japanese Film History, Journal of Film Preservation 72, November 2006: 67-70. Keene, Donald, Variations on a Theme: Chushingura in Chushingura: Studies in Kabuki and the Puppet Theater edited by James R. Brandon and Izumo Takeda, University Press of Hawaii, 1982. Kinema Junpo, Eigasho Shinkan Annai: Eiga Chushingura, March 1967, 434: 85. Kubo, Tomoyoshi, Long-lost 47 Ronin film starring legendary kabuki actor Matsunosuke found in Kyoto, The Asashi Shimbun, October 15, 2015. Matsuda Film Productions, Onoe Matsunosuke no Chushingura. Sharp, Jasper, Historical Dictionary of Japanese Cinema, Scarecrow press, 2011: 45.